Researchers at Carnegie Mellon University’s NanoRobotics Lab have developed a robot that is capable of running on the surface of a pool of water. Like their wall climbing Waalbot, the Water Runner was inspired by the abilities of a lizard, in this case, the basilisk. The team studied the motions of the basilisk and found morphological features and aspects of the lizard’s stride that make running on water possible. 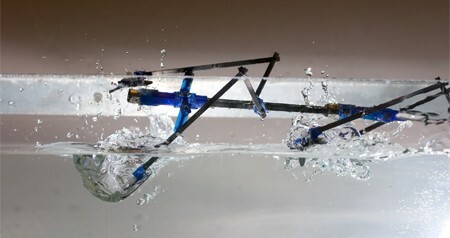 Both the lizard and the robot run on water by slapping the surface to create an air cavity like the one above, then push against the water for the necessary lift and thrust. Several prototypes have been built, and there are variants with 2 or 4 legs and with on and off-board power sources. You can see a slow motion video of the robot’s movement below. The purpose of their research is to create robots that can traverse any surface on earth and waste less energy to viscous drag than a swimming robot would. Though another of the team’s goals is to further legged robot research, the Water Runner is not without potential practical applications. It could be used to collect water samples, monitor waterways with a camera, or even deliver small packages. Download the full abstract in PDF format for more information.